daily timewaster: American Power Projection. 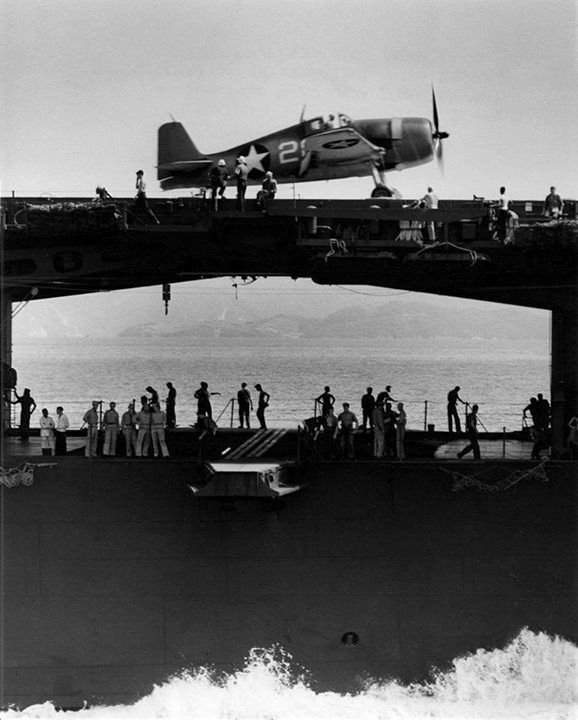 Starboard side view of the carrier Yorktown (Essex-class) with an F6F-3 Hellcat fighter of VF-1 on the flight deck above the athwartship hangar deck catapult, June 1943. "Athwartship". I like that technical term but the real life term we used was "waist cat". And on the Saratoga (Forrestal class carrier), I always enjoyed a waist cat shot, as these were shorter than the forward cats, thus the acceleration was greater, so as to reach the same velocity. With the chest mounted survival gear we wore, one didn't dare try to breathe during the shot. The weight of the gear during acceleration would just evacuate any air remaining in your lungs.